After being held without a goal in his first five games, Sidney Crosby not only ended his slump — he also enjoyed a night to remember. The Pittsburgh Penguins' captain scored his first goal of the season — his 100th in the NHL — and added three assists in a 4-1 victory against the Toronto Maple Leafs at Mellon Arena on Saturday night. "(Milestones) are nice," Crosby said. "It's not what you play for, but they're great accomplishments." Not only did Crosby score his 100th goal, but he also picked up assist No. 200 and the 300th point of his brilliant young career. He now was 302 points in 219 games since being the No. 1 selection in the 2005 Entry Draft. "I don't expect four-point nights, but I definitely wanted to score," Crosby said. "I felt like I was doing some good things, but the puck just wasn't going in." Crosby wasn't the only star for the Penguins in Saturday's win. Evgeni Malkin, another superstar in the Steel City, had four assists. Malkin, 22, has 201 points in 166 NHL games. The two played on the same line for the first time this season — a move that paid huge dividends after they had combined for just 10 points in the team's first five contests. 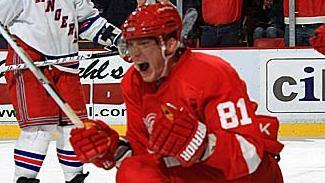 Marian Hossa's first goal as a Red Wing and 300th of his career gave the Detroit Red Wings a 5-4 overtime victory over the New York Rangers. "They certainly had a great game," Pens coach Michel Therrien said of his two brightest stars. "They responded exactly the way we expected. They played well together. They responded on the ice the right way." Toronto opened the scoring on the power play on Nik Antropov's first goal of the season at 5:35 of the first period. The lead was short-lived, however, as Pascal Dupuis tied things up 51 seconds later when he fired Crosby's rebound past Curtis Joseph for his second goal in three games. The assist was Crosby's 200th. "(Crosby) is the best player in the League," said Dupuis, a linemate. "It's always good to play with a guy like that." Miroslav Satan put the Penguins in front with a power-play goal at 7:55 of the second period. With Jonas Frogren in the box, Crosby made a dazzling pass through the legs of rookie defenseman Luke Schenn that landed right on Satan's stick, and the veteran forward redirected it past Joseph to make it 2-1. It was Crosby's 300th point on a night that was loaded with personal milestones. "Sidney was on tonight and kind of sunk us," Joseph said. "He's got great speed, and obviously his slap passes are pretty accurate. He's in a good spot. Usually the best players keep you guessing, and he certainly does that out there." Crosby then scored his memorable goal — his first of the season — with 7:45 remaining in regulation. With the teams at even strength, Crosby carried the puck into the zone and eluded a diving Joseph, who was trying to poke the puck away from Crosby as he skated through the right circle. Toronto's Jonas Frogren tried to knock the puck to the boards behind and to the right of the net, but Crosby regained control and backhanded it toward the slot. He banked a shot off of Toronto's Mikhail Grabovski and into the net. Crosby picked up his third assist of the night just over a minute later when he fed Petr Sykora on a power-play tally. "I was just throwing it out front," Crosby said. "Throw it at the net, and good things happen. I got a great bounce." It was the Leafs' fourth consecutive loss and second in two nights. With his team struggling, the last thing coach Ron Wilson's team needed to see was Crosby's best game of the season. "He obviously had a little luck on his goal," Wilson said. "He made two good plays on the power play. We just didn't execute very well." Antropov was denied a second goal later in the third when it was ruled that he kicked the puck into the net. Pens goalie Marc-Andre Fleury added to the Leafs' offensive struggles with a 26-save effort. Toronto has scored only once in its last two games.